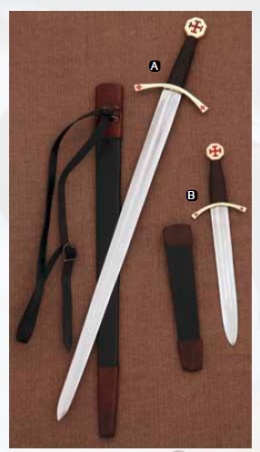 A: Sword- It features an unsharpened carbon steel blade with central fuller. The grip is wood wrapped in braided brown leather and flanked with a solid brass guard and octagonal pommel. Both the pommel and the points of the guard are emblazoned with an enameled red cross. Includes a black and brown leather scabbard with waist belt. Measurements are: Blade Length: 29", Blade Width (Widest): 1.8", Overall Length : 36". This page was last modified on 7 June 2014, at 17:48.